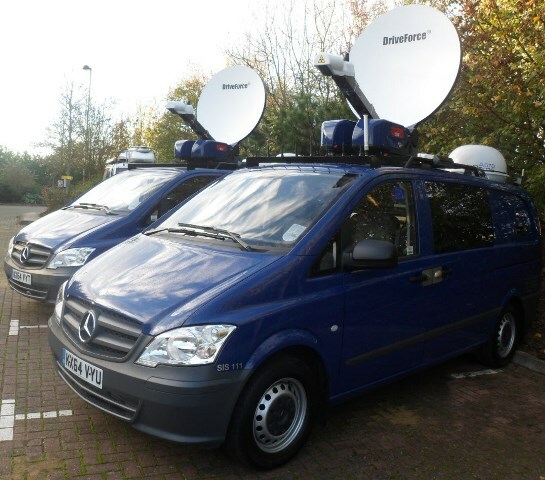 SIS LIVE has delivered six new Satellite Newsgathering (SNG) vehicles to Sky News, as the company further enhances its fast, reliable coverage of breaking news stories across the UK. The compact HD trucks, equipped with state of the art satellite technology, are the latest in a series of satellite uplink systems commissioned by Sky News to enable it to maintain its position as the UK’s premier news gathering channel. As Sky News’ SNG provider for many years, SIS LIVE is well practised in offering the technology and expertise necessary to enable Sky News to capture and transmit award-winning at-the-scene news coverage, wherever and whenever it happens. Our highly specialised teams have worked closely with Sky News to develop six Mercedes Benz Vito vehicles to meet its exact requirements. SIS LIVE’s highly capable support team will maintain the bespoke fleet and provide uplink/downlink services, adding these services to those already supplied to Sky, including camera operators, satellite engineers and satellite capacity. Each truck carries SIS LIVE’s DriveForce antenna, the lightest high power, vehicle mounted satellite uplink system in the world. DriveForce’s reduced weight allows it to be installed on a smaller 3.2T vehicle, avoiding large vehicle speed restrictions and so enabling faster travel to the breaking news event. With a focus on simplicity of operation the design nevertheless offers everything needed for news gathering. On board equipment includes HD, SDI, fibre and wireless camera inputs, and the infrastructure for the installation of future IP solutions. The design and careful selection of technology enables a lone operator to manage the whole broadcast and transmission process, including driving, satellite transmission and camera operation. David Meynell, managing director, SIS LIVE, said: “This bespoke fleet of SNG trucks is the result of another successful collaboration with Sky News. One of the main priorities was that, as a first response news vehicle, the technology not only had to be cutting edge, but also reliable and simple for a lone operator to use. Jackie Faulkner, head of operations, Sky News, said: “As a rolling, 24-hour multi-media news operation, it’s essential we have reliable SNG vehicles which can reach the scene of breaking stories first and send back footage of the highest broadcast quality for inclusion on our multi platforms.